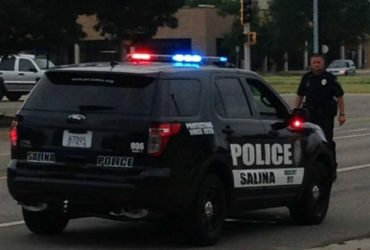 For the 20th December in a row Salina’s “Georgetown Santas” are getting ready. The group of five neighbors have become a popular mainstay in Salina in the days leading up to Christmas each year. Each year they Santa suit up on Georgetown Road in East Salina, handing out candy and popcorn and spreading Christmas cheer. The tradition began back in 1998, when Jack Schmiedeler moved to Georgetown Road. He noticed a lot of traffic at Christmas from sightseers looking at the lights. He bought a Santa suit, stood outside, waved and gave away candy. His neighbor from across the street, Paul McDaniel, asked if he could join in the fun. Other neighbors including Pete Martin, Mike Chaput, and Mel Augustine joined in the effort. Also joining in as Santa’s helpers were Justin Martin, Virgil Michaelis, and Larry Thompson. They began handing out freshly-popped popcorn in addition to the candy. Beginning this Friday, December 21st, the Georgetown Santas will santa-suit up. The Santas will be out Friday, December 21st – Monday, December 24th 6:30pm – 9:00pm nightly.